We all want to feel comfortable in our home, but living in small spaces can be frustrating. Don’t stress! Just a few easy, fun and clever home décor tips can help you make any setting look and feel more spacious. Organize your room efficiently. 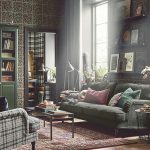 Start by selecting the right kind of storage units from IKEA’s extensive range for any part of your house, be it your living room or your bedroom. Choose furniture that isn’t too bulky to make your room feel less cluttered. Pick light-colored sofas and curtains to give your room a more spacious look. Throw in some bright cushions and you are good to go! Glass top coffee tables can also do the trick to give the feel of more space. The TV stand or entertainment unit is probably the focus of any living room. Pick one from our trendy collection that fits all your gadgets in one place. And don’t forget to keep those messy wires concealed! If you are an avid reader, choose a combination of open and closed book shelves and cabinets to store your books. This way, what you don’t want seen gets hidden and what you want to show off gets seen. You can use any extra spaces to display your favorite collectibles. Allowing natural light into a room also makes the room look bigger. Make sure your windows aren’t blocked and dress your windows with light curtains to give you privacy without compromising on the look of the room. Keep wall art to a minimum! Freeing up your walls does wonders to how big your room looks. Choose light paints and soft contrasts so that the light reflects well and makes the space roomier! Clothes everywhere? Organize your closet drawers with partitions to store small clothing items. Choose storage boxes from IKEA’s iconic range and put away the clothes you don’t use often so you can free up hanging space for clothes you need daily. Try sliding mirror doors for your wall closet to make your room look bigger. Use wall hooks to hang your bags and backpacks to take the clutter off the floor, which again helps the room look more spacious. With these simple tips, you can be assured that your home will definitely be the place where your heart is! 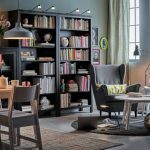 ⟵ What to Consider Before Buying Furniture?